A main road is closed after a four-car collision near Crowborough. According to traffic reports, the accident happened at the junction of the B2026 and New Road. According to a Sussex Police spokesman, they were called to the scene at 3.19pm. 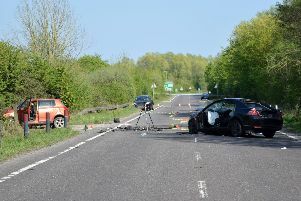 Some of those involved in the collision are believed to have been injured, and the ambulance service has been called to assist, the spokesman said. As the cars are blocking the junction, the road has been closed between New Road and Crowborough Road while recovery vehicles clear the scene. "We are looking to get the road reopened as soon as possible," the spokesman said.